Elizabeth: The Golden Age takes up the story of Elizabeth I where the 1998 movie Elizabeth: the Virgin Queen left off. Elizabeth has remade herself from a tender young princess into a formidable iconic figure, a goddess Queen. Acadamy Award® winners Cate Blanchette and Geoffry Rush reprise their roles as the Queen of England and her head counselor Sir Fancis Walsingham. Samantha Morton (Agatha in Minority Report, Elizabeth Barry in The Libertine) plays Mary, Queen of Scots, who is plotting to depose her cousin Elizabeth, even from her imprisonment. 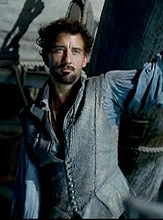 Clive Owen (Children of Men, King Arthur) joins the cast as Sir Walter Raleigh, the object of the Queen's intense interest. Though her heart is as passionate as any woman's, she must deny her desires, having sworn that no man will be her master. She encourages her favorite lady-in-waiting, Bess, to befriend Raleigh just to keep him near. However, this strategy forces Elizabeth to observe their growing intimacy. Religious and political tides threaten to overthrow the nation from within even as the Spanish openly attack England with the largest armada of ships in the world. The king of Spain is determined to restore Catholicism to England and bring with it the Inquisition. Never has there been more at stake for England or Elizabeth. Much of the original team returns to give The Golden Age the magic touch. Producers Eric Fellner and Tim Bevan join co-nominees director Shekhar Kapur, cinematographer Remi Adefarasin, and costume designer Alexandra Byrne on this extravagent film. The first movie was nominated for 7 Acadamy Awards and 3 Golden Globes, so look for more Oscar® buzz on this one next year. invades English waters with an army of 10,000. Though this is the same subject matter that was so brilliantly covered in the 2005 television mini-series Elizabeth I that won a best actress Emmy for Helen Mirren, judging by the recently released theatrical trailers this film will do what movies do best—big-screen spectacle. 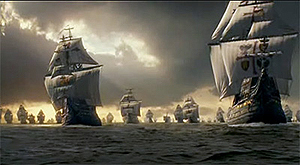 There are no holds barred in bringing the Spanish Armada to life and sweeping us up in the absolute beauty of the locations, costumes, music, and gorgeous actors on screen. This looks like a succulent feast of a movie you will need to see on the large screen and then purchase on DVD to study in detail later. Release Date: October 12, 2007. PG-13. Visit the Official Website. 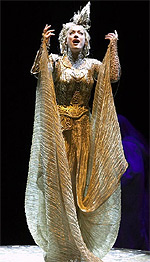 At £25 million, The Lord of the Rings is the most expensive musical ever brought to the London Theatre. After its out of town trials in Toronto the director tightened up the rambling story and ragged staging by cutting 45 minutes from the overall length and giving it more punch in the process. Now it is bringing in record crowds in London and those of us in the USA are hoping that it will cross the pond to Broadway, LA, or even Las Vegas, which is rapidly becoming the the new West End for musicals and theatrical spectaculars. Unfortuately no plans have been announced yet. But if you are planning a trip to London in the next 9 months, you should look into booking tickets now. The long-awaited stage spectacularThe Lord of Rings, based on the books by J.R.R. Tolkien, opened in London at the Theatre Royal Drury Lane in May to mixed reviews. Though some fans of the novels and movies fault it for leaving out storylines and characters they love, it still covers much of the original material in a 3-hour musical with two intermissions. But instead of trying to create a strict version of the books, the authors Matthew Warchus and Shaun McKenna have used the magic of the stage to find a new way to tell one of the greatest epic myths of our time. They weave an enchanted tapestry of color, music, dance, and emotion to draw the audience into the fantasic realms of Lothlorien and Mordor. The music and lyrics bring life to inner thoughts and emotions of the characters and define the mystic races. 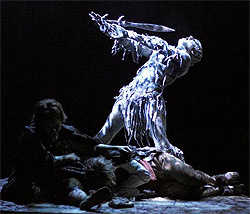 Michael Therriault gives an emotional performance through his tortured dance and jerky postures as Gollum that starts with his first appearance climbing from the rafters to trail Frodo and Gandalf and never relents until he falls into the Cracks of Doom. The composers A. R. Rahaman and the musical group Värttinä come from India and Finland to create a new sound that blends Bollywood musicals with ancient folk music and Enya-style Celtic arias. The staging is breathtaking with over 70 actors, Cirque acrobats, and dancers. The sets are created from wicker forms that seem to materialize before your eyes and rotate to reveal the action on all sides. Parts of the stage rise and fall and spin as battles burst from the revolving stage into the audience and up into the air like Kabuki warriors. 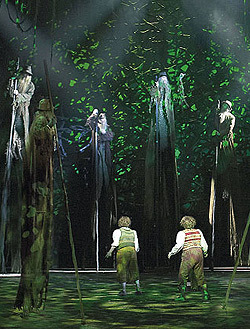 Tiny Merry and Pippen wake the Ents of Fangorn who are on stilts so incredibly tall they have to lean on staves like little old men. There are creepy battles with orcs on springy prothetic limbs who move like no humans move, and the spider Shelob is every bit as frightening as a nightmare. Each scene is a dazzling, special-effects filled experience that will leave you breathless. The seat prices range from £15 (about $30 US) for the upper balcony to £60 for a stage side stall or seat in the dress circle. Since so much of the action takes place high in the air above the sets and the sets are made to be seen from above all the seats have great views. You can view video of the performance, backstage preparations, and listen to music from the Lord of the Rings on their Official Website. The Tudors returns to Showtime next spring with Peter O'Toole playing the role of Pope Paul III, who threatens King Henry VIII (Jonathan Rhys Meyers) with excommunication and eternal damnation for his pursuit of Lady Anne Boleyn. While O’Toole is possibly best known for his Oscar®-nominated work in the title role of David Lean’s sweeping epic Lawrence of Arabia (1962), he made cinematic history by being only one of four actors to earn Best Actor Oscar® nominations for playing the same role in two different films: he played Henry II in Becket (1964), and, opposite Katharine Hepburn, in The Lion in Winter (1968). He has earned a total of eight Oscar® nominations, most recently for his work in last year’s indie drama Venus. In 2003 he was awarded a special Lifetime Achievement Oscar®. In the first season finale of The Tudors , Henry and Anne’s passionate affair has reached a fevered pique and Henry’s obsession with making her his queen has grown all-consuming. As Season Two begins, Henry’s desires are thwarted by the Church, an obstacle that makes him even more determined to separate Parliament from Church. After Henry secretly marries Anne and has his marriage to Katherine (Maria Doyle Kennedy) declared invalid, Pope Paul III (O’Toole) moves to excommunicate Henry and the two have an ongoing feud with a fallout that has repercussions in England to this day. The Tudors Official Site on Showtime. If you want to add this article to your list of favorites or email it to a friend, please use this permanent URL, https://stores.renstore.com/-strse-template/0708A/Page.bok. Permission is granted by the author to quote from this page or use it in handouts as long as you include a link back to Renstore.com.